Deuces Wild Video Poker is The #1 Highest Rated Free Dueces Wild video poker. True casino Video Poker on iPhone and iPad! Hit the jackpot with a Royal Flush or use the app to as a video poker trainer to train your skills against real Video Poker mechanics! 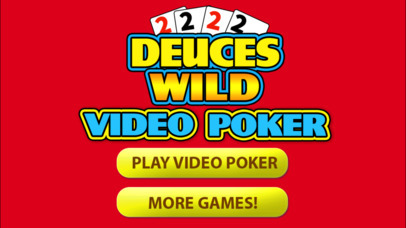 Deuces Wild Video Poker brings a complete video poker experience to your device. With authentic dueces wild poker game, real card shuffling, and real paytables, you will get a Las Vegas video poker feeling –- anywhere, anytime. So get set to play with this top rated video poker on iPad and iPhone! ＊ Ran out of credits? Go to the credits store to buy more or get some for free!